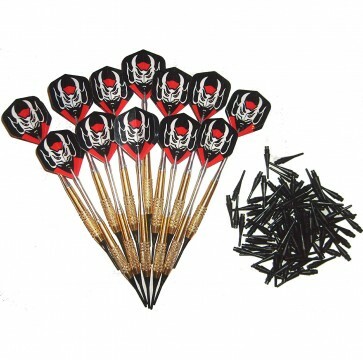 In this offer you will receive 12 semi-mounted darts with 100 darts for soft darts. The barrel is made of sturdy brass with a grip-proof profile, so you do not slip off when the dart is dropped. The shafts of the 12 darts are made of lightweight aluminum and the dart a balanced weight distribution. For better hold of the shanks, we also recommend these Rubber rings for mounting on the shank thread .